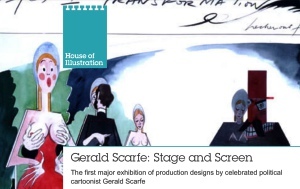 Currently running (until January 21st 2018) at London's House of Illustration is "Scarfe Stage & Screen" - an exhibition about Gerald Scarfe's varied work for stage and screen. It's a rare opportunity to explore the extensive but little-known production designs by the celebrated political cartoonist. Storyboards, costumes and props are on display from Pink Floyd's The Wall, Disney's Hercules and English National Ballet's The Nutcracker. We understand that there is a fair amount of Floyd-related material on display amongst his work for other projects, so should definitely be worth a visit next time you are in London. More details, and to book tickets, visit HouseOfIllustration.org.uk. The venue is open 10am - 6pm Tuesday through to Sunday, and is just around the corner from King's Cross railway station. The House of Illustration is a registered charity. As well as putting on 10 exhibitions a year, it works with schools across London on projects with young people that inspire creativity and enable them to communicate visually, overcoming barriers such as language, literacy levels and special educational needs. It is the only UK gallery commissioning new illustration work for public display and runs the only residency for illustrators and graphic artists, supporting artists at every stage of their career.